Vancouver International Airport, YVR, Canada’s second busiest airport, is located in the suburb of Richmond, B.C. When I took a tour there I learned a lot of unique things about the building itself … like how it conserves energy: sidewalks and escalators slow down when they’re not in use. Colours and textures calm crowds and minimize noise. Aquariums are strategically placed to calm as well as entertain. Circular seating areas with flat screen TVs are designed in such a way that when you sit inside the circles you can hear the TVs, outside, you can’t. Each YVR gate has a specially designed counter and foot hold where laptop owners gather to work while waiting for their flights. A painting of BC forest, mountains and sea by Canadian Group of Seven artist, Lawren Harris, was selected as the colour palette for YVR’s interior. Huge glass curtain walls give travelers spectacular views of the ocean and the mountains. Wood, a British Columbia resource, is widely used throughout. What really impressed me about YVR though, is its outstanding collection of Northwest Coast native art. According to the airport’s art foundation, it’s what drove the vision for the new YVR terminal. Anchoring the collection is Bill Reid‘s The Spirit of Haida Gwaii: The Jade Canoe. Canadians know it from the back of the Canadian $20 bill. I also loved walking through Pacific Passage, an entry point for US travelers. My passage view was dominated by a giant Thunderbird sculpted by Connie Watts. 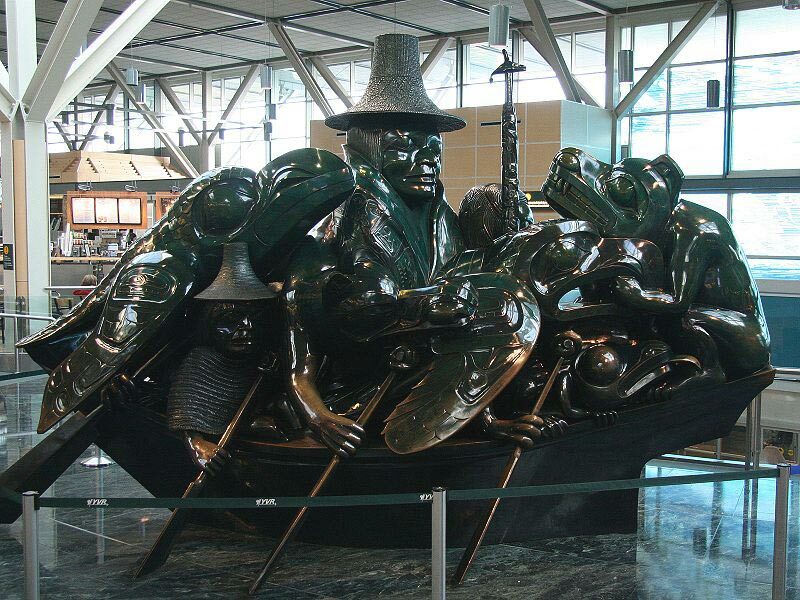 But it really doesn’t matter what vantage point you enter YVR from, beautiful native art greets you at all points. In times of troubled international flight, I think YVR is a facility that attempts to lift our spirits to a higher plane. That makes it a welcoming gateway for those headed to Canada’s west coast.